Liz Huntly is a mover and shaker, a barefoot philosopher, a collector of languages. She mostly lives in Ontario, Canada, but feels at home anywhere she can comfortably get into Vrksasana. She's infinitely curious about the body & the breath, plants, art, magic, beauty, failure, and how to find the sweetness of being lost in the world. She's writing a book that she'll probably never get around to starting. She wants to watch you fall in love with yoga. Occupation: Yoga teacher. Part-time farmer. Full-time dreamer. Favorite yoga pose: Depends on my mood, the time of day, & what I ate for dinner. I love that it’s a never ending process. Every time I get on the mat it feels new. I’ve done Downward Dog a billion times but there’s always something fresh to discover when I arrive in it again. There will never be a point in my practice where I can say I’ve seen or felt or tasted every possibility. I’ll never have it all figured out. I’m an inexhaustibly curious person, so this potential for exploration keeps me coming back. Yoga has helped me to understand that my physical body and my mental health are not separate. 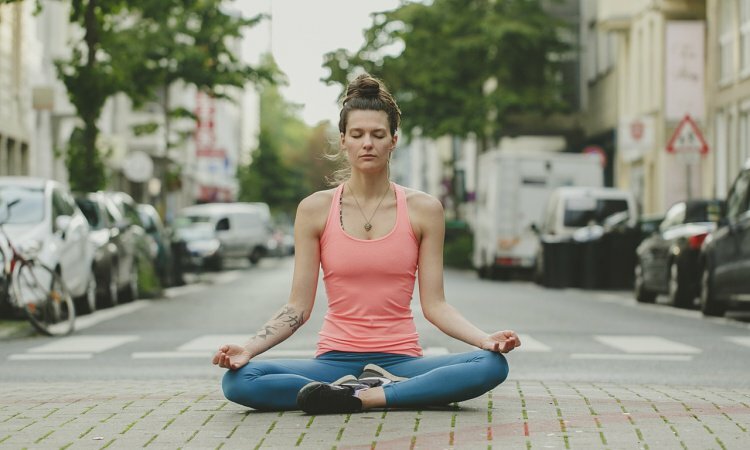 By becoming more intimately aware of my physical body through asana and breathing practices, I’m able to see the connection between how I’m feeling in my body and how I’m feeling in my mind. Over the years this has helped me to make better choices about how I eat, how I sleep, and how I move, or to simply notice the origins of mental discomfort when I don’t make good choices. Well, breathing, first and foremost. Which is an every day thing that we’re mostly not thinking about, but I think about it more now. I breathe slower these days, and deeper, and more consciously. Which of course changes everything else. I’m also better at routines, and staying true to commitments, and I’m getting better at speaking with care, and being present when I’m listening. I still interrupt my husband all the time though; I’m really not perfect at any of these things. But yoga also helps me be better at living with my everyday imperfections. I like going to other people’s classes every now and then, but I also really value my own personal practice. That’s often where the best exploration happens. Sometimes the challenge is to do new things in the practice, but often I find the bigger challenge is to keep plugging away at the same old things. 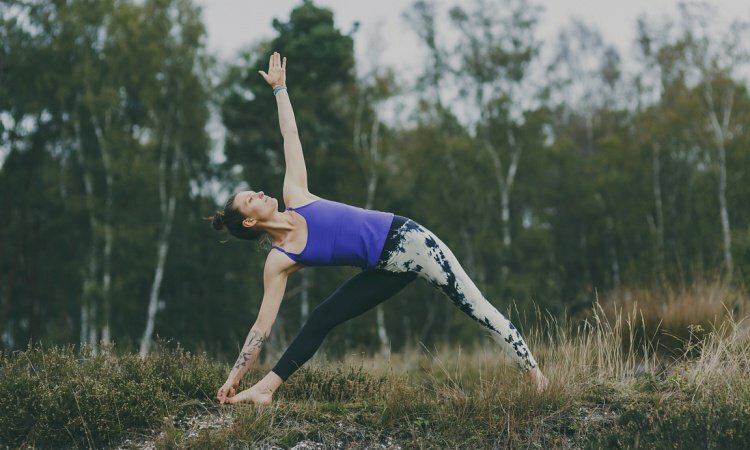 There are always deeper layers to peel away in the simplest poses and the quietest moments, and I find that these subtle breakthroughs are as much a source of excitement and inspiration as learning a new arm balance or a more extreme backbend. I also need off-the-mat practice to keep my creativity and motivation alive. Meditation and reading and music and cooking and mucking about in the garden are all facets of my yoga practice. If I don’t honour all the ways my body wants to move and explore and taste, then the practice of asana becomes hollow. The magic can only exist when the approach is holistic. I’ve been deeply influenced by Thich Nhat Hanh. I haven’t had the opportunity to meet him in person, but I’ve spent time at his community, Plum Village, in France, and have read several of his books. His teachings on mindfulness have been extremely helpful to me in all facets of my life, and I’m also quite inspired by his approach to building conscious community. My husband and I share a rural property with my parents, and a constant stream of house guests, and we’re really interested in co-operative living. It seems to me that people become so isolated in our modern way of life, despite increased opportunities for digital connection. But communal living can be kind of messy, so I’ve found it helpful to gather up examples of how harmonious communities work. Warrior III. It seems like such a simple thing, but there’s no other poses where I feel like I’m working so hard and having so little fun. Happy Baby for the longest time. Or sometimes I just like to roll out my mat and lie on it without really doing anything at all. There’s something about lying on the ground, looking up at the underbelly of the world, that’s comforting. Maybe things just seem more open and possible from that perspective. Plus I think sometimes the best reaction to stress or fatigue is non-action. We’re so conditioned to always be doing something that we feel guilty if we just stop for a moment. Even meditation becomes another item we can cross off the to-do list. So I like to take 5 or 10 minutes of doing nothing on my mat to really give the mind and the body a rest. The sound of my breath. If I’m at home, there’s also the constant soundtrack of birds chirping and critters buzzing and the wind rustling the trees. But I do enjoy a good mellow playlist. Right now my top go-to's are DJ Drez, East Forest and Garth Stevenson. Every morning when I was growing up, my dad would say to me “today is the first day of the rest of your life.” And I would roll my eyes at him, especially when I was a teenager and really not excited about the prospect of another day in school. But over the years, I’ve come to understand that it’s really intelligent to allow yourself to see each day with fresh eyes. And to see each day as a breeding ground for every possibility. Don’t be so hard on yourself. This practice is your playground. We are here to explore, to learn, to discover our innate joy. We are here to unravel so that our true self can blossom. Hardness and gripping in the body and mind will disrupt this process of soft unfolding.